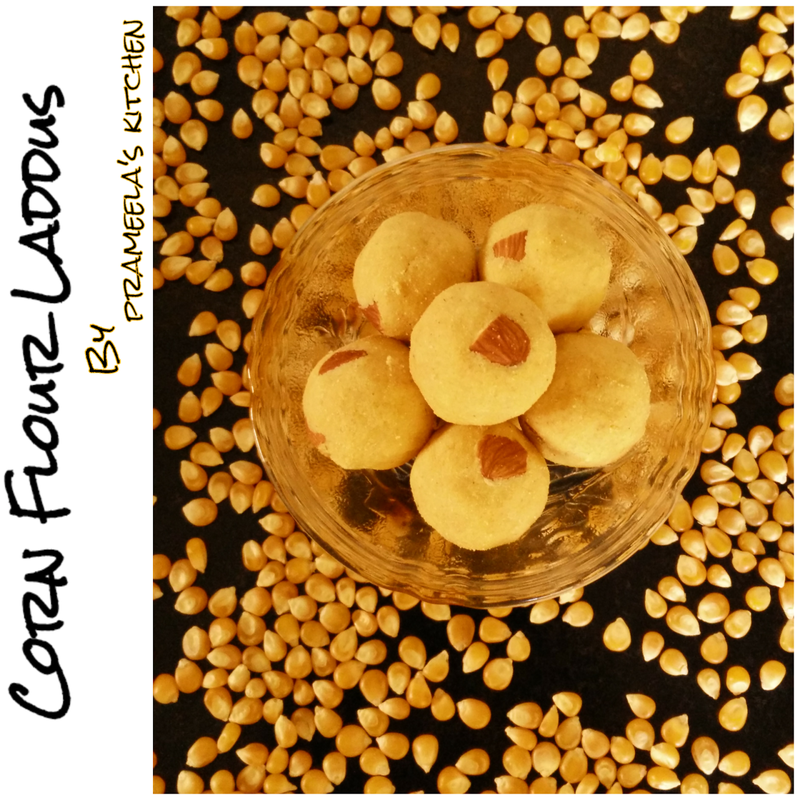 Corn flour laddus are nutritious and very tasty. Dry roasted corn flour will be mixed with sugar powder and hot ghee to make delicious laddus. Adding crushed cardamom makes this dessert authentic Indian laddu. What made me to try this recipe ? Grind the sugar and cardamom into a fine powder and keep it aside. In a large thick bottomed pan dry roast corn flour in a low/medium flame. You should stop roasting when you get a nice aroma.Another way of checking is, it will start becoming light brown at the bottom. It took around 5 minutes for me.Transfer the roasted mixture to a large mixing bowl. 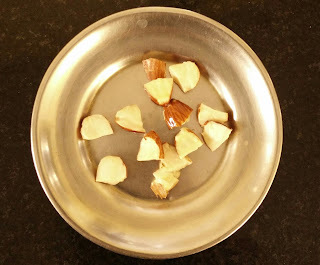 Now heat 1 tsp of ghee in the same pan and roast chopped almonds. Transfer roasted almonds into a small bowl. Heat the ghee in the same pan or some other vessel and keep it ready. Now add ground sugar cardamom powder into the same mixing bowl. 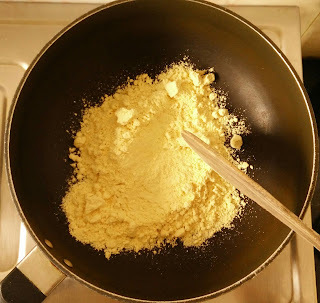 Add warm ghee little by little and mix the mixture well using spatula. 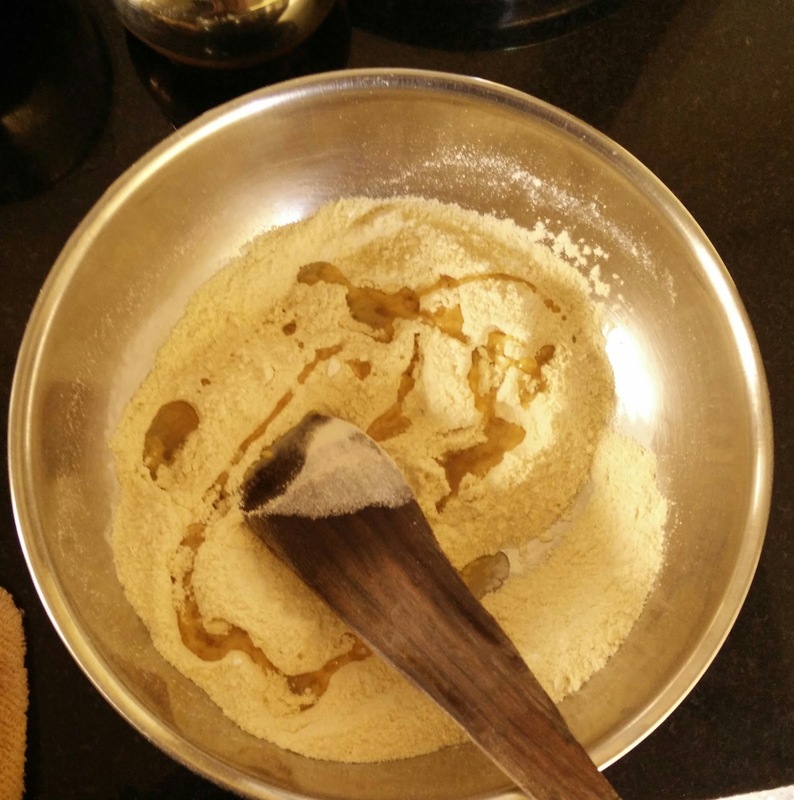 You should get the mixture into a right consistency where you can make laddus out of it. [ Adding more ghee spoils the recipe, never add more ghee.Add ghee little by little, mix well and check whether you have reached the right consistency. Once you get the right consistency , Start preparing laddus when the mixture is warm. 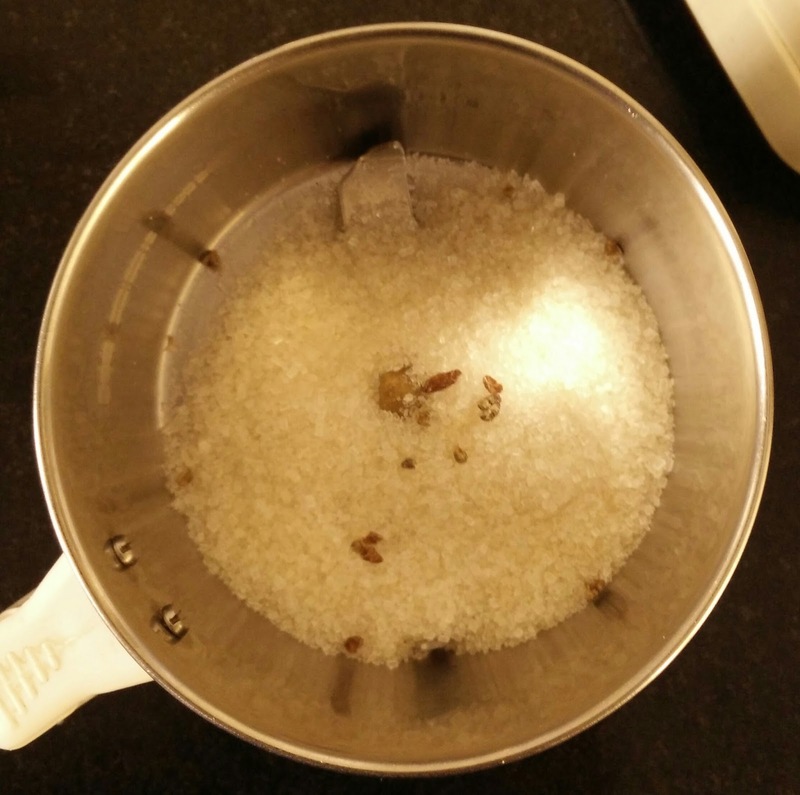 You have to be little quicker here as you have to finish off everything before the mixture becomes cold. Garnish each laddu with roasted Almonds on top. 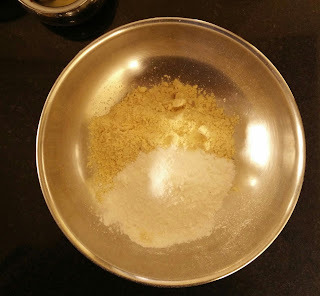 [If required grease your palms with little ghee].Look at the pic below, mixture looks dry, but still you can make laddus. 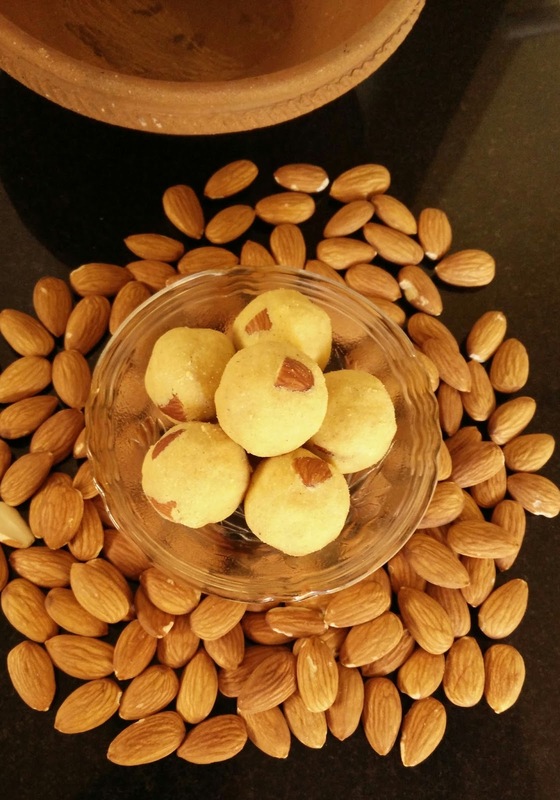 Instead of almond you can choose your favorite dry fruit like cashews, raisins, pistachio etc. 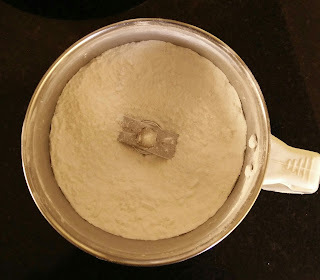 Exact quantity of the ghee required for the recipe depends on the corn flour we use. 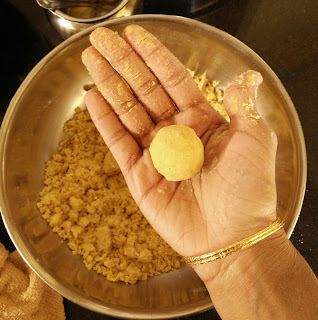 Add ghee little by little and mix.If you are able to make laddus(roundels) you can stop adding ghee. 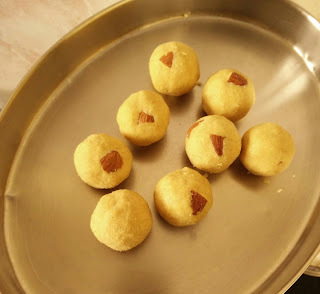 Little grainy texture of the flour really makes these laddus yummy.